As a result of ischemia or hemorrhage, blood supply to neurons is disrupted which subsequently promotes a cascade of pathophysiological responses resulting in cell loss. Many mechanisms are involved solely or in combination in this disorder including excitotoxicity, mitochondrial death pathways, and the release of free radicals, protein misfolding, apoptosis, necrosis, autophagy and inflammation. Besides neuronal cell loss, damage to and loss of astrocytes as well as injury to white matter contributes also to cerebral injury. The core problem in stroke is the loss of neuronal cells which makes recovery difficult or even not possible in the late states. Acute treatment options that can be applied for stroke are mainly targeting re-establishment of blood flow and hence, their use is limited due to the effective time window of thrombolytic agents. However, if the acute time window is exceeded, neuronal loss starts due to the activation of cell death pathways. This review will explore the most updated cellular death mechanisms leading to neuronal loss in stroke. Ischemic and hemorrhagic stroke as well as subarachnoid hemorrhage will be debated in the light of cell death mechanisms and possible novel molecular and cellular treatment options will be discussed. Keywords: Ischemic stroke, hemorrhagic stroke, apoptosis, necrosis, autophagy, pyroptosis, neuroprotective therapies. 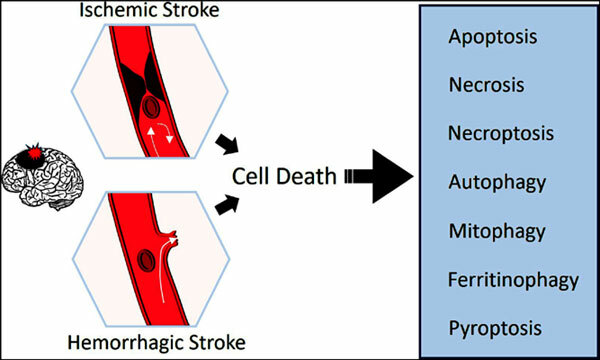 Keywords:Ischemic stroke, hemorrhagic stroke, apoptosis, necrosis, autophagy, pyroptosis, neuroprotective therapies. Abstract:As a result of ischemia or hemorrhage, blood supply to neurons is disrupted which subsequently promotes a cascade of pathophysiological responses resulting in cell loss. Many mechanisms are involved solely or in combination in this disorder including excitotoxicity, mitochondrial death pathways, and the release of free radicals, protein misfolding, apoptosis, necrosis, autophagy and inflammation. Besides neuronal cell loss, damage to and loss of astrocytes as well as injury to white matter contributes also to cerebral injury. The core problem in stroke is the loss of neuronal cells which makes recovery difficult or even not possible in the late states. Acute treatment options that can be applied for stroke are mainly targeting re-establishment of blood flow and hence, their use is limited due to the effective time window of thrombolytic agents. However, if the acute time window is exceeded, neuronal loss starts due to the activation of cell death pathways. This review will explore the most updated cellular death mechanisms leading to neuronal loss in stroke. Ischemic and hemorrhagic stroke as well as subarachnoid hemorrhage will be debated in the light of cell death mechanisms and possible novel molecular and cellular treatment options will be discussed.